20 Litres of Cool Flo ME Glycol. Cool ~ Flo ME is a high performance Mono Ethylene Glycol based heat transfer fluid designed for secondary refrigerant and industrial cooling applications. Cool ~ Flo fluids have been specifically designed to deliver higher resistance to degradation, scale, bacterial growth and corrosion. 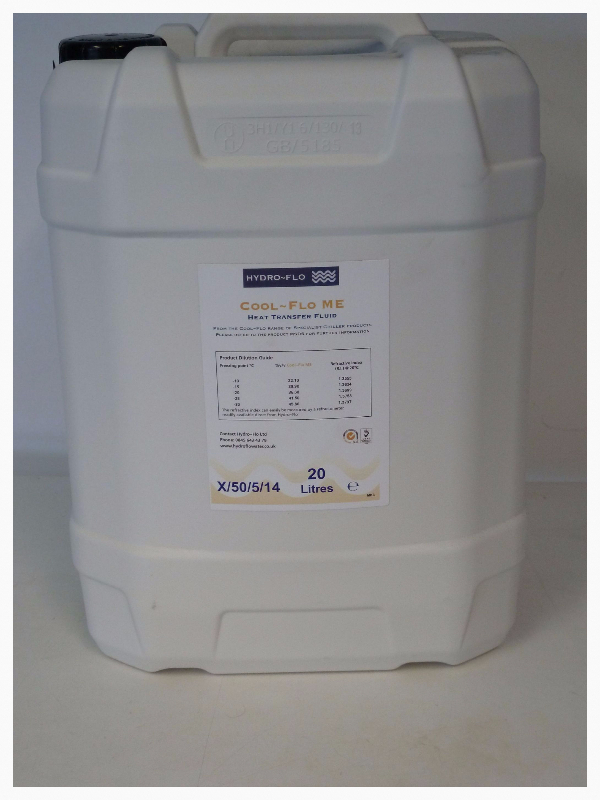 Cool ~ Flo ME has a shelf life of 2 years and is available in 20, 215 & 1000 litre container sizes and bulk. There are other variants of the product for highly specialised applications and for further information or assistance, please call the support team at our sister company Hydro~Flo Environmental on 0800 048 4881, who will be happy to assist you further. Cool~Flo ME is the most advanced product available for chilled water applications and the chiller industry in general.